At Camp Strawderman, riding is one of our main activities. There is nothing quite as exciting as a ride over the surrounding mountain trails on horseback. We pride ourselves on a stable of over 30 camp-owned horses, who will nuzzle you with love before whisking you away for a morning lesson or afternoon adventure. We encourage all campers to take advantage of our professional instruction, beautiful animals, and our pristine mountain trails. Riders are grouped according to ability with classes in beginning, intermediate, and advanced equitation. Each girl is given the chance to ride a variety of horses according to her proficiency. Once a camper is truly at home in the saddle, she can qualify for instruction over fences. All our riders are invited to display their newly developed equestrian talent in a horseshow, before qualified judges, at the end of each two-week session. See calendar for riding event dates. Of course, all our horses need a little TLC. 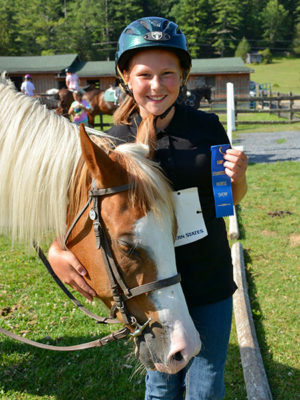 So, we offer interested campers the opportunity to learn grooming and horse care. It’s a chance to take an active role in the care and feeding of these beautiful animals and enjoy a special bond with a four-legged friend.